A chronic or non-healing wound can be terrifying. It can easily become infected and lead to amputation, or worse. When we’ve found that red and infrared light therapy can heal any wound up to 200% (!) faster, we had to let everyone know. 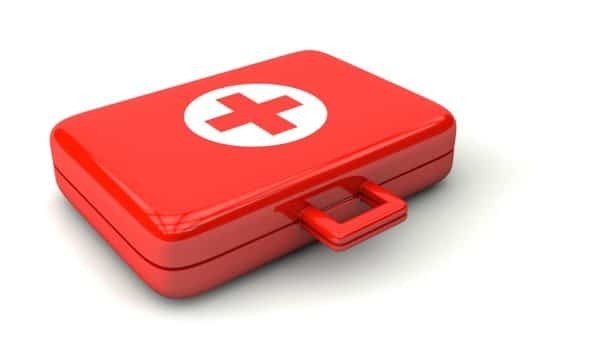 Red light therapy for wound healing is a natural, scientifically proven and safe way to heal chronic and non-healing wounds, no matter their cause. (Note: I am not a doctor and I encourage you to consult with your doctor about any wound). 1 Red Light Therapy for Wound Healing: How Does it Work? 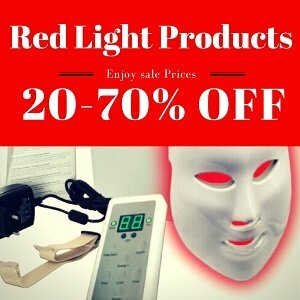 2 Who Can Benefit from Red Light Therapy? 3 When Can You Expect Results? 4 Are There any Side Effects or Risks? Red Light Therapy for Wound Healing: How Does it Work? According to many studies, biologists have found the cells exposed to near-infrared light (energy just outside the visible range) from LEDs – grow 150% to 200% faster than cells not stimulated by this light. Infrared light rays increase energy inside cells that speed up any healing process, and penetrates all the way into your skin and deeper. Infrared light therapy is described by science in terms of wavelength, measured in nm. Any number between 620 nm to 680 nm is visible red light. Any number between 700 and 1100 is invisible near-infrared light. 1. Studies have found that near-infrared wavelength increases microcirculation and formation of new capillaries. 2. Low-level laser promotes lymph system activity – this helps with detoxification of the wound without overtaxing the lymph system and prevents lymphedema. 3. Infrared rays clean up dead cells: boosted blood circulation helps with cleaning up dead or damaged cells, including dead bacteria. 4. Infrared therapy promotes collagen production – as proven in many studies, cold laser (red light waves) stimulates collagen and elastin production in the final wound healing phases. 5. It helps release ATP (raw cellular energy) which gives energy to the damaged cells in the wound so they can heal better and faster (study). Israeli physicists have discovered that the heat from laser light can weld flesh back together. Now they’re experimenting with using it to heal wounds instead of using traditional stitching. Who Can Benefit from Red Light Therapy? 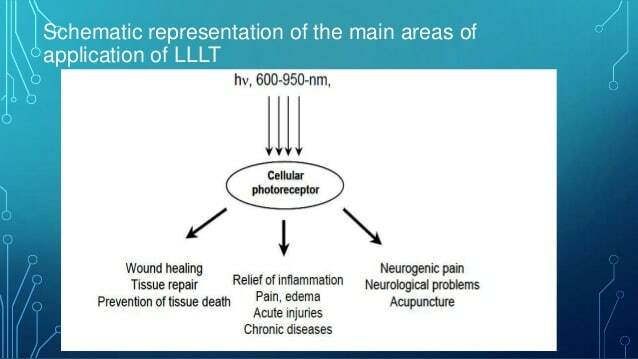 There are many studies that prove that red light therapy (Low-Level Laser Therapy) can close any non-healing wound (a wound that doesn’t heal after 4 weeks), even in diabetics. Depending on several factors (your nutrition, for instance), it takes an average of 47 days and no less than 4 weeks of daily treatments, to heal a chronic wound. Studies have shown that healing can occur even after only 3 days. But for some, it can take months. Obviously, a natural and side-effect free treatment that can prevent infections and amputation is worth it – no matter how long it takes. Red light therapy is a proven side-effect free natural method. If you use it correctly, you’ll enjoy a safe treatment. However, you still have to protect your eyes, to be on the safe side. These products can produce high glare, so use eye protection, like these safety goggles. Never look directly into your home red light therapy device. These days you don’t have to pay for expensive clinic appointments to naturally treat a non-healing wound. There are a few excellent red light therapy home devices and lamps you can use every day at home – starting today. Infrared heat lamps are reddish near infrared bulbs, also known as “heat lamps”. 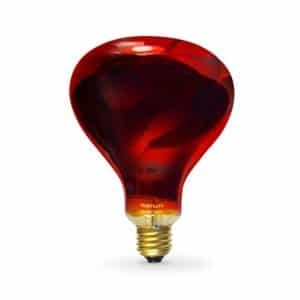 These powerful 250-watt heat bulbs emit near infrared rays with red, orange and yellow light combined. 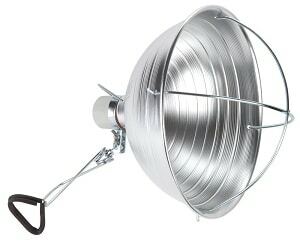 The heat from these lamps can penetrate deep into your wound, up to about 2 inches in! 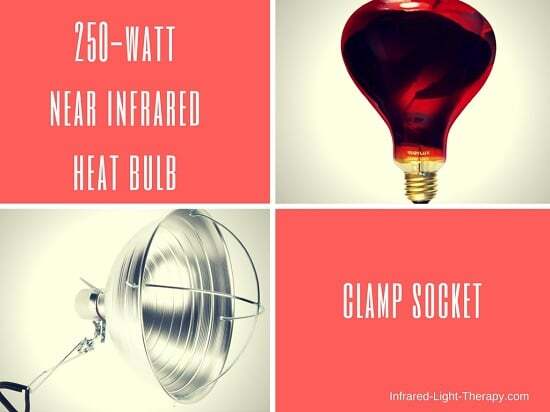 To use a near infrared heat bulb safely, you’ll need a clamp socket designed for a 300-watt bulb, like this one. Clamp the socket to a convenient place (a chair, a bed, headboard etc.) where you can move your wound close to the lamp. Keep a safe distance of about 12 inches away from the lamp, and if at any point the heat feels too much, move further away from the lamp. Do not let the lamp directly touch your skin. Also, move the lamp or your body slightly during the lamp session as otherwise, it may cause a slight burn. Point the light to the surrounding area of the wound too. Set a timer for your session. Red Light therapy is very relaxing and you may fall asleep and over treat yourself. According to studies, the optimal treatment time is 1.5 – 5 minutes per treatment area, every day until the wound is healed. You can get a pre-made infrared lamp HERE. If you trust the FDA, you should know that at the time of this writing, red light therapy has not been approved by the FDA for wound care. That’s why you won’t find home devices advertised for this purpose. 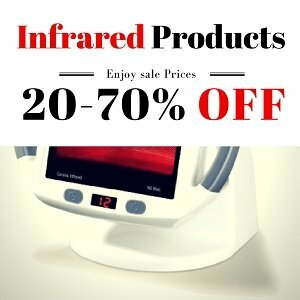 Home LLLT devices have already been approved for things such as pain relief and wrinkle reduction, and you can find a few high-quality LED infrared devices on the market right now. You’ll need a home device that is powerful enough though (and is mostly infrared), and place it closer to the wound, about 1 inch away from it. Through our research, one of the best home infrared devices for wound care is Baby Quasar MD Plus. Yes, it’s expensive, but it’s yours to use 24/7, and if it doesn’t work – you can send it back and get a refund. Note: Handheld devices are better than panels because they are portable, easier to point in the exact position and easier to hold in place. Red and infrared light therapy for wound healing are safe and proven to work. No matter the cause of your chronic wound (Neuropathy, Diabetes, surgery, anything), this natural wound healing method can prevent infections and amputation. You will have no adverse side effects if you don’t overdose yourself. I truly hope you give it a chance and spread the word about this wonderful natural treatment for non-healing wounds. Do you have any questions or comments? What’s your experience with natural wound healing? Please let me know if the wound has to be uncovered for the light to work or will it still work through a bandaged wound? To my knowledge it will work through a bandage, though you may need to get the light a bit closer. Hello, will this work for a very bad case if plantar Fasciitis. I have been to 5 doctors inured extremely painful shots, Acupuncture, physical therapy, you name it. I’ve tried it. I have been in alot of pain daily for over 3 years now. It has destroyed my life. Will it cure kidney weaknesses? Will it cure foot nail fungus etc? How often do I use the 250 watt infrared lamp on on 1/4 inch diameter shallow pressure wound on my bottom. I’m a paraplegic. I would start with once a day. But, please make sure you keep the light at a safe disatnce of at least 12 inches, because you will not feel if it’s burning your skin. I would also consult my doctor about how to do ths treatment. Yes, but in any case just don’t look directly at the light. Hi I live in the UK. I want to purchase a high quality near infrared bulb 250w more or less like ruby but we do not have them over here. What reputable brand would you recommend? I would recommend the Wells Poultry one. From the post: “According to studies, optimal treatment time is 1.5 – 5 minutes per treatment area.” Do this every day for at least 40 days. Good luck! What would be the best time each day and distant treatment for a deep leg ulcer for a lady who is 88 ? I am doing a rotator cuff surgery. I assume I will ice for a couple of weeks. At what point would one use the red light therapy? You can use it once there is little to no inflammation in the area. Good luck! Can you use and IR illuminator that’s made for night vision cameras? They admit a 850nm of light and are far cheaper than what’s designed for therapy. That’s an interesting idea…:) However, it’s not thought to be the best wavelength for wound healing – it should be more in the range of red and near infrared wavelength. I have a 36 watt 660 , how far away should it be from my skin ? Since it’s low power, just get it close enough to feel comfortable heat. what do you think about this bulbs ? Which is best ? I would go for the RubyLux, but they are all good. What do you think about this https://sauna-life.com/Infrared/Philips-Vitae/PHILIPS-Vitae-350W::61.html?language=en ? I have old cupboard size 47x23x67 inch, how many of Rubylux bulbs I need? The link you’ve provided does not work so I can’t look at it. As for your cupboard size, it seems a little small to me, and I would only use 1-2 bulbs in it. You have to make sure you’ll be able to keep a safe distance from the light as instructed in the post. I will try to keep the distance, maybe find bigger cupboard, I think it would be better if it is place for rotating on a chair. Please and can you write me the best material for covering an electrical cables-use shielded cables? So how to minimize EMF? Or with infrared lamps is not so bad? I’m sorry but I’m not very good with electricity, I can’t help you with that. Maybe someone in the community can answer this? As for the EMF, as you can see in the video, the EMF is very low and reduces to none if you keep that safe distance. The local Home Depot and Lowe’s have Red 630, Green 525 and Blue 450 led bulbs at 3W and 8 W. Could I use the 8 W for treatment? I cannot find the power density info for these bulbs to calculate treatment doseage. I have a rather deep surgical wound that will not heal. It still has to be packed and bandaged everyday. Can I use the red light even though my wound is packed and bandaged? Will it be effective at this point? Or should I wait until the wound progresses to the point that it does not have to be packed or bandaged anymore? Thank you for your help. To be on the safe side, I would consult my doctor about this. However, to my knowledge it’s safe to use it without the bandage, as long as you keep it in a safe distance. Listen to your body and see how it feels. My husband is in a dementia facility & he has had sore buttocks for 3 months, but, now (8 months) he has open ulcers & I have had 4 different doctors look at him–primary, dermatologist, wound specialist and facility medical personnel & they all prescribe different kinds of creams. Now, they have him on a cream that is almost $400.00 an ounce that insurance does not cover. He is in so much pain, he screams every time someone wipes him. I was there yesterday, determined to leave him naked from the waist down, and after 6 hours, free up pull-ups, he seemed better from the air! I am tired of crying every time I visit, because he does not deserve this condition & they won’t do what I say. I am going to buy an infrared light & go there a couple of times per day. I want a hand-held. Thank you for whatever you can suggest! First I would continue with airing out the area as it helped so much. Always continue with what helps. 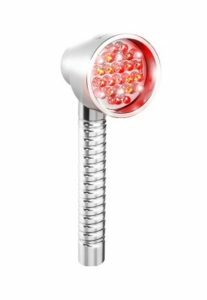 As for a hand-held red light therapy device, I would suggest the baby quasar red as mentioned in the post. I hope he feels better soon. Time recommended for red led light 660nm 12w for bruising? To my knowledge you can use for 20-25 minutes once a day. My small dog had a lump removed from his tail and the skin graft did not work, now he has an open wound that we are treating. Would 1 to 2 miniutes, 12″ away everyday, with / without bandages be a good routine for him? I have a kind of wound on my lips, a kind of inflammation that the outer layer of the skin of the lips keeps peeling off because of an old wound(both lower and upper lips). Each time a new layer of skin starts to grow, it peels off again because apparently it is a new skin and there is always pressure on the lips hence I have to talk, eat and drink through it. I had the issue twoyears before but after some months and after a lot of vitamin c,and plasma therapy it got heald. Can the infrared of 100 watts (R95E) help to heal it. It’s worth a try, but keep it at a safe distance and use safety goggles to protect your eyes. I would also use those vitamins and supplements again since it helped you the last time it happened. How do I use an infrared hex handheld heat lamp on a pubic boil? Should I use it as the heater for my warm compresses? You can do that, but to get the benefits of the light you’ll need to point the heat lamp to the boil directly, keeping it at a safe distance of 24 inches. To my knowledge if you are 6 weeks after surgery you can use the red light to heal your wound. Good luck!